Ponca Tribe of Oklahoma is one of two federally recognized tribes of the Ponca people. The other is the Ponca Tribe of Nebraska. The Ponca Tribe of Indians of Oklahoma is headquartered at White Eagle, near Ponca City, Oklahoma. Their tribal jurisdiction spans parts of Kay and Noble counties. In the 1700s, the Ponca Indians separated from the Omaha tribe and established villages along the Niobrara River and Ponca Creek in present Nebraska and South Dakota. There they subsisted on horticulture and bison hunts. Until 1750, the Poncas’ territory stretched from the Missouri River to the Black Hills. In the 18th and 19th centuries, smallpox and other diseases drastically reduced their numbers. Sioux warfare forced their withdrawal to an area near the mouth of the Niobrara River. The Ponca never warred with the United States, and in 1817 they signed their first peace treaty. A trade agreement followed in 1825. In 1858 and 1865 the Ponca also signed land cession treaties in return for military protection and economic assistance. During the 1860s and 1870s, droughts, failed bison hunts, and an incessant Sioux threat brought the Ponca to the brink of starvation. In 1868, instead of honoring its treaty obligations with the Ponca, the US ceded Ponca land to the Sioux. Rather than renegotiate the Sioux treaty, the federal government removed the Ponca to Indian Territory in 1877. The Ponca removal was grossly mishandled. The US not only failed to obtain the consent of the Ponca chiefs but also neglected to provide a reservation with adequate facilities. According to some estimates, during their first years in Oklahoma about 158, or nearly a third of the tribe, perished during the first years in Oklahoma. The southern Ponca, under principal chief White Eagle, settled on a 101,000-acre reservation in present-day Kay and Noble counties in Oklahoma. They established winter camps along the Arkansas River, and continued to practice their tribal customs. They leased most of their land to non-Indian farmers and ranchers, including the Miller brothers of the 101 Ranch. Ponca culture came under pressure in the 1880s and 1890s. Agents and missionaries sought to abolish traditional dances, marriage practices, and religious customs. Despite tribal opposition, in 1892 the government imposed its allotment policy on them. This resulted in the eventual alienation of much of their land. In 1911, the Ponca came under pressure once again, after the discovery of oil on and near their reservation. The development of the Ponca and Tonkawa oil fields caused environmental problems, forcing the Ponca to abandon their winter camps along the Arkansas River and move onto individual allotments. Despite these pressures the Ponca continued to shape their culture. Many joined the Miller Brothers’ 101 Ranch Wild West Show, which allowed them to reenact aspects of their traditional lifestyle. The introduction of the peyote religion permitted them to establish their own version of Christianity. Two young, educated Poncas, Frank Eagle and Louis McDonald, were cofounders of the Native American Church in 1918. In 1919 Ponca World War I veterans formed an American Legion chapter called Buffalo Post 38. This organization revived such traditional war-related practices as the Ponca war dance (heluska). Dancing remained the central expression of traditional Ponca culture. Throughout Oklahoma the Ponca were known for their knowledge of songs and dances. They made important contributions to the development of powwow culture on the southern Plains. The annual Ponca powwow, one of the oldest powwows in Oklahoma, which is held every August. In 1950 the Ponca organized a tribal government in accordance with the Oklahoma Indian Welfare Act of 1936. 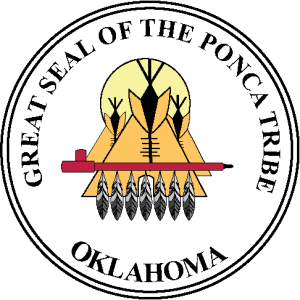 In 2003 the Ponca Tribe of Oklahoma had 2,549 enrolled members. In 1950 the Ponca organized a tribal government in accordance with the Oklahoma Indian Welfare Act of 1936. The Ponca Tribe of Indians of Oklahoma is headquartered at White Eagle, near Ponca City, Oklahoma. Their tribal jurisdiction spans parts of Kay and Noble counties. The Ponca Tribe of Oklahoma are proud of their language. In 2009 an estimated 33 tribal members spoke the Ponca language. Today the Ponca Tribe of Oklahoma is growing strong. They thrive in culture and tradition. In 2003 the Ponca Tribe of Oklahoma had 2,549 enrolled members. They operate their own housing authority and issues its own tribal vehicle tags. Their tribal jurisdiction is relatively isolated and they have worked to create jobs for their people. The estimated annual economic impact of the Ponca Tribe in 2011 was $1,964,321, down from $15 million in 2008, when the casino was operating.